I wanted to point out a few more great crime stories, and wonderful authors, for those looking to buy books for Christmas. This is fun for me because I have met these authors in person, but I've also been able to read what they've written, so I'm not recommending blindly. Michael Robotham is an Australian author who, I'm ashamed to say, I'd never read until about two months ago. He did a book signing here in Austin and I picked up a couple of his novels, and got the chance to have a beer with him. One of those incredibly nice, down-to-earth people that if you met him under other circumstances, you'd never know that when he does a book signing in Germany, 700 people show up to meet him. 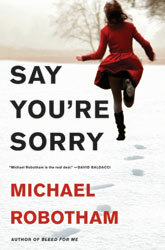 His most recent novel is SAY YOU'RE SORRY. David Baldacci: "He's the real deal and we can only hope he will write faster." Val McDermid: "'Heart-stopping, heart-breaking, heart-wrenching." Linwood Barclay: "Robotham doesn't just make me scared for his characters, he makes my heart ache for them." I know what you're thinking - on top of those endorsements, he gets Mark Pryor's too! Well yep, he sure does. Lisa Regan sees her book actually come out today, and I heard her talk about it at the conference. Called FINDING CLAIRE FLETCHER, it's the kind of book that, when you hear about it, your hair stands on end. Here's her blog, but seriously, click on the link for her book and go read about it. (By the way, if you recognize her name it might be from here, she's been a loyal supporter and poster on D.A. Confidential since long before either of us were published, so that alone merits you checking her out). Nancy Thompson has a novel featuring a Brit living in the U.S., the Russian mafia, kidnapping and murder. It's called THE MISTAKEN. Nancy is simply hilarious, a ton of fun and from what I've been told managed to get published the first time she tried. Trust me, that means she's good. What's next? I predict a bestseller with this one, actually, and I'm going to talk about this book when it comes out in February, but I mention it here and now because you need to save a gift card or two to get your copies. THREE GRAVES FULL is by the hugely talented first-time author Jamie Mason, someone I plan to get to blurb one my my upcoming novels. Racheting up suspense is one thing, and Mason manages it masterfully... But portraying characters so well and so thoroughly, examining and explaining their motives even for murder, requires a level of skill that is rare, marking this as an astonishingly accomplished debut and Mason as a writer to watch very closely." "Mason's quirky debut novel deftly weaves dark humor into a plot that’s as complicated as a jigsaw puzzle but more fun to put together.... a dandy of a first outing with not a single boring moment." 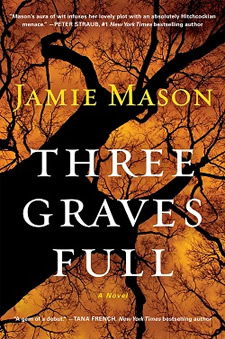 "Three Graves Full is an astonishing debut novel, smart and stylish and wonderfully light on its feet. Jamie Mason writes crisp, surprising sentences, and this aura of wit infuses her lovely plot with an absolutely Hitchcockian menace. I think she was probably born to be a writer, and I eagerly look forward to whatever she will do next." 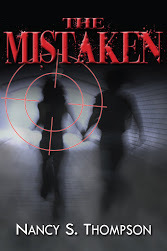 “Jamie Mason wields a pen that magically blends beautiful prose with unrelenting thrills. Each page delivers something new and fresh; in her hands, even the mundane becomes extraordinary. Grab a chair with a comfortable edge, because Mason will keep you poised there until the final page." Did you spot the name Tana-blooming-French? Oh, just my very favorite author in the world. Oh, and if you can't wait to get THREE GRAVES FULL, you can pre-order it now and lock in your copy. I wouldn't blame you at all, after all I have done just that myself. What great recommendations! 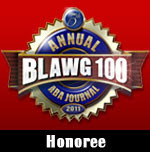 I'm humbled to be in such amazing company! Can't wait to read Jamie's book will definitely check out Michael's. Nancy's is one of the best thrillers I've ever read! Thanks, Mark! Wow, what a total surprise!! And lots of great recommendations here. I will add the first and last to my TBR list, right along with yours, of course. I often lurk here but don't comment for fear of appearing a stalker. Yes, I am blushing right about now! Thanks again!! Gangs - what are they good for?